Kyphoplasty treatment for back hump caused by Osteoporosis is a surgical procedure. It can be used to remedy fragility fractures of the spine. In the past compression fractures of the spine were treated by bed rest, bracing and pain medication. These things addressed pain.but they can not change any of the spinal deformity caused by these fractures. This procedure addresses both the pain and the spinal deformity. 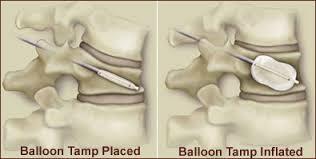 Kyphoplasty treatment stabilizes the fracture(s), corrects vertebrae distortion and in doing so relieves pain. 1. What is done during Kyphoplasty treatment? When you have this procedure, a surgeon makes a small incision in your back and inserts a narrow tube. Then using fluoroscopy to guide him, he moves this tube into the correct position in the fractured area. Using X-ray images your doctor inserts a special balloon through the tube and inflates it so that the balloon elevates the fractured part of your vertebra and returns those vertebra to a more normal shape. The balloon also compacts the soft inner bone and creates a cavity inside the vertebrae. Next your doctor removes the balloon and inserts a special cement like material (polymethylmethacrylate) into the cavity. This material hardens quickly. Your vertebra is stabilized in position! 2. Is this an operation? Will they use anesthesia? Yes, this is surgery and is done by a surgeon specially trained in the procedure. You will have either local or general anesthesia.If you have concerns about general anesthesia because of your age or other medical conditions, be sure to discuss the possibility of using local anesthesia with your doctor. 3. How long does Kyphoplasty take? The surgery usually takes about 1 hour for each vetebra treated. Of course you will spend time in the recovery room afterwards. 4. Will I be hospitalized? Some patients have kyphoplasty treatment as one day surgery. Others stay in the hospital overnight. In any case you will not be able to drive after the surgery so if you will be going home afterwards you will need to arrange transportation. Your physician will advise you about this. Be sure to ask. Much depends on how many vertebrae were treated and the particulars of your surgery. Some patients find immediate relief from their pain; others find it takes a few days for full pain relief. Most patients resume their activities on a limited basis and then expand that as their recovery continues. NOTE: You will need to wait for your physician's approval before you can drive. The most immediate benefit is a reduction in pain. Those who have had this procedure also report greater mobility and ease doing ordinary tasks. Posture can be straightened significantly and usually the treatment improves breathing and lessens the likelihood that you (or the patient) will experience additional fractures caused by the extra pressure of vertebra 'tilting'. 7. O.K. those are the positives but what are the risks? As in all surgery there is always some risk of a reaction to anesthesia or a risk of infection. Nerve damage or a spinal cord injury during the operation. Nerve or spinal cord injury from the cement leaking. Allergic reaction to the solution used to see the balloon on the x-ray image. 8.Who is a candidate for kyphoplasty treatment ? Can anyone with pain from dowagers hump (back hump) have this procedure? It can not be done on 'old fractures'. The Kyphon corporation site lists 6 months as a possible 'window'. However, you need an individual evaluation of your condition. Some fractures are not amenable to this treatment. It is usually used on compression fractures. Patients with pain from vertebral fracture should speak with their health care provider and arrange an evaluation by a surgeon trained in the procedure. the fracture is more than 2 weeks old but is less than one year old and is not yet fully healed. 9.Will my insurance pay for this procedure? As with all medical procedures it is important to check with your medical insurance company before you have the procedure. Medicare will usually pay for the procedure. Other insurance companies vary in their payment. More information about back hump: Click on: Dowagers Humps Treatment page or the Vertebroplasty page.